Mitchell Lake, the fifth man made impoundment in a series of six Coosa River Lakes found running from north to south Alabama, can be deceiving. It looks like a big lake when first encountered, but actually Mitchell Lake is less than 20 miles in length, from Lay Lake dam at its headwaters to the lower end of the lake at Mitchell Lake dam. Again, in fishing terms — looks can be deceiving. Although Mitchell Lake, is a rather small lake (especially if compared to other Alabama Impoundment’s), it is still a great lake to explore as waters cool during the fall to early winter period. Whether an angler targets spotted bass, largemouth bass or even those ever moving striped bass, its a sure bet within a day’s fishing in the headwaters of Mitchell Lake, his quarry will be found. 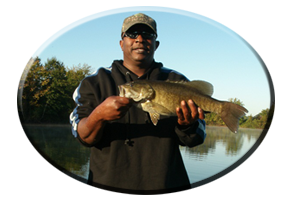 Often fooling all three bass species in one day (including a trophy bass or two within each species), is very possible during the entire fall season and often this action lasts on into the early winter period. From Mitchell Lakes headwaters, to the far back ends of its major feeder creeks, there are some very catchable bass just waiting to be had on any day during the fall season. These cool weather bass can be fooled on a variety of lures all fished from top to bottom this fall season. Just like when fishing other portions of the lake, being in the right place at the right time or during the right circumstances…is when an angler catches fish. Not when running all over the lake, burning a lot of gas, with nothing in the means of fish to show for the days fishing can often be the results. Its simply called, staying put. Here in these Mitchell Lake headwaters timing is everything. Calling the Alabama Power Lake level info and water generation number at 1-800-lakes-11 is suggested, if you plan on fishing the lakes headwaters just below Lay Lake dam during the most productive times. Its no secret by those anglers that frequently fish below these Alabama Lake dams, these lake headwaters are seldom very productive if the water is not moving. Here an angler can really mop up on numbers of spotted bass species during the fall period. 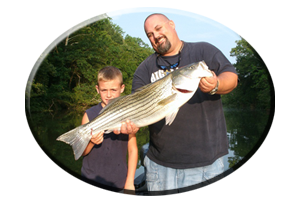 There are a lot of 1-2 pound size smaller schooling spotted bass, often seen erupting on the waters surface. But don’t be fooled. 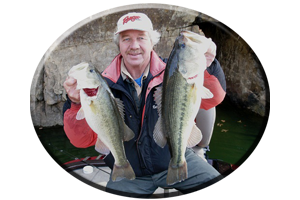 During each fall and winter season some of the year’s biggest trophy sized spotted bass are taken, that is by the angler fortunate enough to land one of these true, tackle testing bass. Largemouth bass are not usually associated with moving waters such as what’s seen below Lay Lake dam in Mitchell Lakes rocky headwaters during the fall season. But they are here. Usually following a day or two of heavy fall rains the current is increased from water being released at Lay Lake dam. Big meals are then washed through the dam, such as minnows, crayfish, catfish, crappie, bream or oversized baitfish, such as the now bigger end of the year threadfin shad and gizzard shad. These crayfish and baitfish that survive the swift dam discharge waters or those prey that are just living below these dams in Mitchell Lakes headwaters are susceptible to becoming the days next meal. They can be found holding in eddy areas away from the swift main lake current. The largemouth bass seem to know the best places to lay in wait. Rocks, boulders, islands, main lake points and rock bluff banks make up the lakes upper mile of current swept headwaters. Some aquatic weeds are here, but only if the lake is at full pool. 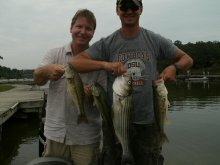 All are homes to some trophy sized spotted bass and some big, largemouth bass. Even a striped bass can be fooled once in a while in these lake headwaters. But what about those other bass in other parts of the lake? Mitchell Lakes mid section and lower lake consists mostly of places anglers fish main lake waters this fall season. (More on fishing its two major feeder Creeks Hatchet Creek and Weoguftka Creek next.) Leaving the lakes headwaters and heading south down stream, anglers will immediately notice several main lake islands. One island found immediately (about one mile), below Lay Lake dam is a flat and long island. It is dubbed, “Airplane Island” due to its mid island section featuring an airplane landing strip. Other islands feature towering rock bluffs so far above the lakes water line and so tall, very few boaters have ever even parked the boat and explored them. Bass gather around these islands, places that can block the swift main lake waters found here in the fall. From here on down the lake to the public boat launch (Mitchell Lakes Higgins Ferry boat launch), are rock bluffs, main lake points, timber and stump filled small cuts and pockets and loads of aquatic weeds that line the banks, places to explore that hold all species of bass this fall season. 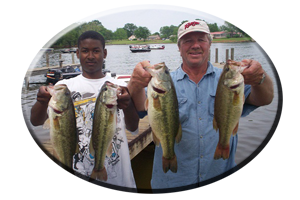 Anglers can target Mitchell Lakes weeds by probing deep within the weeds with jig combos and Texas rigged worms or they can fish topwaters and spinnerbaits all among the weeds. Topwater lurers such as buzzbaits, frogs and rats and even spinnerbaits are proven favorites for fall’s largemouth bass found in and around these weeds. Besides main lake waters and the lakes headwaters there are always plenty of fish to catch in the lakes major feeder creeks. Across the lake and downstream about one mile from Higgins Ferry State public boat launch is the junction of these two major feeder creeks. Here these two creeks join the main lake waters with water depths of over 50 feet found around the main lake island nearby. Leaving this junction and heading up in Hatchet Creek you will notice the huge amount of visible cover such as the constant weed lined banks and wood cover found all within the weeds. 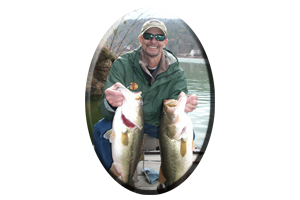 Anglers that like to flip and pitch lures like jig combos, tube baits, worms and lizards of all sizes while getting the boat in close to fish thick and matted weeds, are right at home here. Deep diving crankbaits, floating and suspending jerkbaits and rattling lipless crankbaits like Bill Lewis Rattletraps, Rapala’s Rattlin’ Raps and Cordell’s Rattling Spots are all especially good reaction strike lures when cast all around the sides and ends of laydown trees and along both sides of main lake points. About one mile traveling up in Hatchet Creek on your right is actually a small feeder creek. Its called Pennemotly Creek. Good for harboring schools of baitfish in the fall and also good for feeding bass all throughout the fall season. This section may call for the use of lighter line and the use of smaller lures due to clear water clarity. As you travel up in Hatchet creek you will see a small weed lined pocket loaded with fallen trees, brush and laying logs with an island very close to the weedy bank. This is a good spot (normally considered to be a community hole), no matter how many anglers you see fish it. It is very close to a deep water junction where Hatchet Creek and Weoguftka Creek join. It is also very susceptible to high winds and baitfish that are usually on its wind blown banks following windy days. From this creek junction far up in both creeks the water gets shallow the further you travel up in each feeder creek. It can get dangerous for navigating. If the lake is low even more so. Use extreme caution and study your map before navigating unknown waters on Mitchell Lake this fall season.